It’s that ground again. Pitches have been the cynosure of ICC’s watchful eyes recently, but most of these have been in Test match cricket. However, the surface and more vitally the dimensions of Eden Park have been the talking points from the previous game which saw Australia chase down over 240 against the Kiwis to carry a 100 per cent record into the final. A flat pitch and some of the shortest boundaries in world cricket, along with an in-form batting line-up of some of the best T20 players in the world saw the record-breaking target easily achieved in the end. The bowlers from both sides will hope for something more out of the surface, but the groundsmen will need to tread that fine line – water the surface too much and who knows, a repeat of that low-scoring 2015 World Cup game could be in pipeline. Either way, Australia will enter the game with the kind of confidence they would probably have never experienced in this format. Not only have they won four games in a row, beating both New Zealand and England twice apiece, the wins have been quite one-sided. New Zealand, on the other hand, has struggled. Their solitary win in the group stage of the competition came early in the tournament when they edged England out by 12 runs and only qualified thanks to a slightly better net run-rate than England. In their previous game which they could lose by up to 20 runs and still qualify, New Zealand fell away towards the end and lost by a couple of runs. Going into the final, and despite the lottery that is associated with this format of the game, the form of both teams leading up to this game couldn’t be further apart. 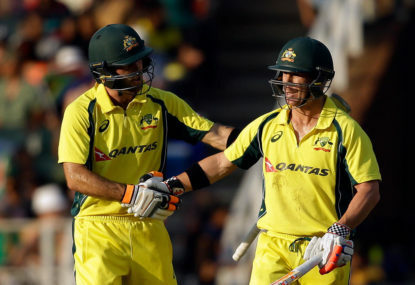 Australia has all their bases covered but one – they have never batted first in this tournament. Their wins have all come chasing targets and it would be interesting to see how they go about defending a target at Eden Park. Join The Roar for live coverage of T20 tri-series final from 5pm (AEDT).